Next time you travel, put yourself in first class with the latest generation of small in-ear headsets. NEW YORK (MainStreet) -- Every wonder why those men and women who actually drive the plane -- you know, the pilots -- wear those honkin', industrial-strength earmuffs and microphones? It's not a fashion statement. Those monster headsets keep the din of plane flight out. And quiet and productivity in. Until recently, probably the best way to get audio tranquillity on the go was with a set of pricey and bulky so-called active noise reduction cans. Those units emit crafty bits of noise that cancel out the roar of the jets and the shrieks of miserable infants. Next time you travel, put yourself in first class with small in-ear headsets such as the NuForce NE-700M. No more. Thanks -- yet again -- to smartphones such as the Apple ( AAPL - Get Report) iPhone and Motorola ( MOT Droid, dozens of makers are vying to make high-quality headsets that fit snugly inside your ear canal, offer surprisingly good microphone quality for use with a mobile device and isolate your ears from the outside world. In-ear headsets must fit properly or they can be both painful and dysfunctional. But get the right device and you will enjoy an audio experience that turns even the harshest plane flight into a joyride. And you can do it all with something that fits in your coat pocket. Who knew the folks at Spider -- a decent audio/video cable company -- had it in 'em to make such a great pair of headsets? But they do. For my money, this company's realvoice headsets are the biggest story in in-ear headsets right now. For $90, you get a great-sounding pair of headphones, a mic that can work with an iPhone and remarkable isolation from the outside world. While less than true first-quality sound, this is as close as you can expect for the money. Remember, you must take the time to fit the different size earplugs to your ears, which can be, uh, hygienically dubious. But get past the ear-goo factor and you can expect some real R&R on your next redeye. I'm not sure whether it is the aluminum body, the titanium drivers or the company's attention to detail, but the NuForce NE-700M is a $75 headset that not only sounds pretty darn good, but feels like it won't fall to pieces in your pocket. 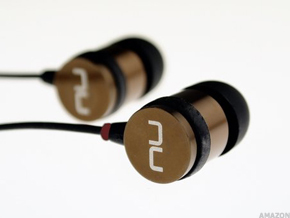 Factor in the slick look, attractive bronze finish and high-quality smartphone mic and, for me anyway, the NuForce is about the sharpest-looking and sounding in-ear headset on the market. I am not -- nor will I ever be -- a big active noise reduction headset fan. The electronics almost always add bulk and cost. I can't stand noodling with all the switches involved. And worst, I can hear the active noise reduction in the music itself. But if you absolutely, positively must have a little switch that turns the outside world off and on, the AKG K 390 NC is worth a close listen. The 390 is exactly what you would expect from one of the world's most storied audio and headphone companies: top-quality construction, an elegant control module that controls several iPhone functions and a top-flight microphone that should work to business telephony standards. Yes, you are paying twice as much as what you spent on your iPhone. But for first-quality active noise reduction headsets, the AKG are probably worth it.